Specialists caution that biotechnology is advancing at an unprecedented rate, and therefore it is vital that we examine the impact of national regulations for use in agriculture. Cali, Colombia, 12 April 2018 (IICA). Biotechnology and biosafety regulators from eighteen countries in the hemisphere participated in an international biotechnology seminar that explored new genome editing technologies. Genome or gene editing makes it possible to produce hereditary changes, for example mutations, which are predictable, planned and permanent in a specific site in an organism’s genome. This editing is not considered to be transgenic modification, since according to experts, it does not introduce foreign DNA into the final product, but uses a system of DNA repair of the cell. 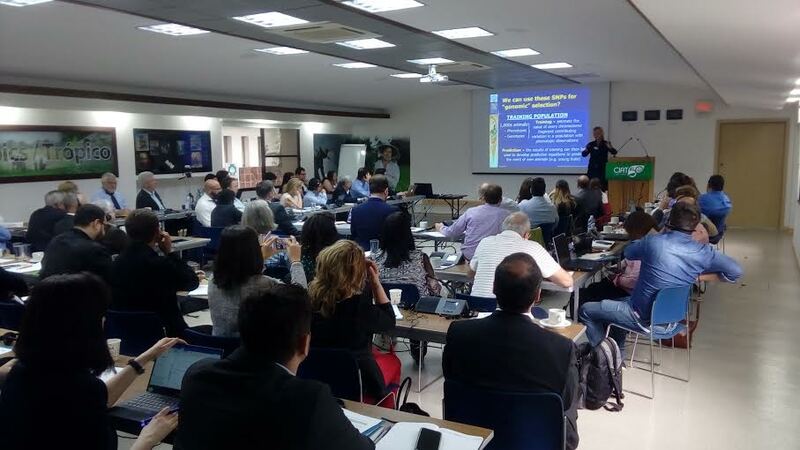 Organized by the Inter-American Institute for Cooperation on Agriculture (IICA) and held at the headquarters of the International Center for Tropical Agriculture (CIAT) in Colombia, the seminar was attended by United States Department of Agriculture (CIAT) Undersecretary Greg Ibach who gave the assurance that the USDA is working to update biotechnology regulations and to modernize the biotechnology regulatory framework of the Department. He commented that “we are drawing on three decades of experience of overseeing the safe use of genetically modified plants, while seeking to create a visionary approach that ensures that we are prepared for the future”. Ibach further stated that new innovations that enable greater precision, such as CRISPR and TALEN, offer enormous opportunities to improve nutritional value, to improve sustainability of new plant varieties and contribute to world food security. “It is vital that regulatory oversight is structured in such a way as to take into account what we have learned in supervising the safe introduction of transgenic crops and these new scientific innovations”, he added. The meeting examined the technical concepts underpinning these new technologies, reviewed genome editing applications and identified concrete examples of advances made in resolving problems arising in animal agricultural production. It also reviewed policies in countries such as Argentina, Brazil, Canada, Colombia, Chile and the United States that relate to the new biotechnology era, as well as advances made in research and regulations in other countries of the hemisphere. According to IICA’s biotechnology and biosafety expert, Pedro Rocha, genome editing marks a new era in biotechnology. It involves a group of more precise and safer technologies that offer enormous possibilities for solving problems in agriculture and livestock rearing, among other applications. “Genome editing is a novel field that will no doubt develop at a dazzling speed from a technical perspective, but it raises certain questions from a regulatory perspective, such as whether we possess the knowledge and maturity to analyze new products created by these technologies and to take decisions that either curb or promote innovation in distinct sectors, and thus the technological future of agriculture and livestock rearing is being discussed”, said Rocha. The seminar also covered other key topics such as the importance of communication to facilitate the gathering of reliable data that contributes to greater understanding and to the use and acceptance of new technologies in countries that intend to innovate using these tools. Pedro Rocha, International Biotechnology and Biosafety Specialist at IICA.